That's a great tip on freezing berries to avoid colouring the dough. They look buttery and delicious, Jean. Thank you, Angie! Wish I had one right now to go with my cup of Darjeeling! Feel free to send all your seconds/blems/factory rejects my way. The color purple works for me whether it’s purple rain, royal purple, or the color of suffering. Purple, purple, purple. Even the “purple people eater” is a nod to benevolent cannibalism. Scones not so much. Rhymes with stones, and even though I know yours are flaky soft with perhaps a little resistance in the crust, to me scones are as dry as stones. Sort of like munching on plaster of Paris. But then we know I am utterly without class when I sit down at the trough…table. Utterly! :D Sully, yes, purple is lovely, but I don't like purple dough! You really must try the recipe. If you do exactly as I say, you will amaze yourself with how easily you can turn out a scone instead of a stone. These look fabulous and the tip about waiting for the berries to refreeze a bit is four star, whether you cut them or not! 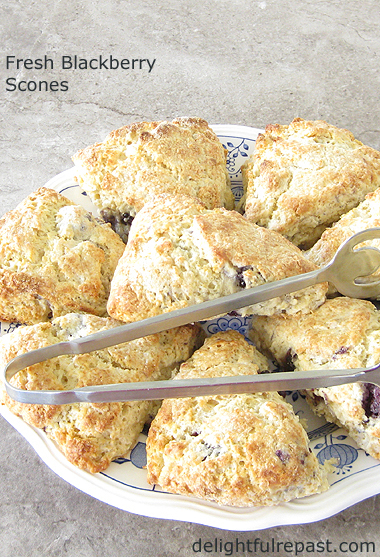 Once I get through my surgery and scones are back on the menu, I think I'll be trying these! And thank you for such kind words on my watercolors. I'm still a work in progress. When you decide you're ready for it, you'll fall in full force! Karen, thank you. And how I envy you your blackberry supply! That's the kind of "invasive" plant I could live with (unlike the dandelions I am constantly battling!). Thanks, Jeanie! It will be wonderful when you have your surgery behind you! What a fantastic tip about freezing the berries for a bit so they don't bleed; I'll definitely sqirrel that one away for use! Ooops... apparently I can't spell squirrel today (bunnies on my mind). Great idea with the freezing the fruit. I don't do blackberry...had them coming out our ears as I grew up...and used in every way imaginable. I developed an aversion from over use, I guess. Any other berry I LOVE...but not blackberries! Happy Easter! Mrs Shoes, glad you liked the tip! Ruth, you sound just like my dad was about chicken! He'd had too much of a good thing as a child! Oh my gosh these look amazing!!!! Can you send some to me pretty please? I am not the best at breads and scones, unfortunately! Oh my, dearest Jean, what a temptation, you never fail to amaze me, my friend ! Debbie, I'd love to deliver some to your sweet home! Put the kettle on! Give the recipe a try, though, you just might surprise yourself. Dany dear, thank you so much. Wishing you a wonderful week! I always have fresh blackberries in my fridge, Jean, and I'd love to make your recipe. Scones are one of my favorite things to make and I always love trying a new recipe. Of course, having a scone and a cup of tea, sounds perfect to me. Happy Easter to you! Kitty, thanks. I hope you'll try them soon with some of your berry stash! How wonderful, Jean! Yum! They DO look gorgeous! I was watching Father Brown on Netflix and the church secretary made strawberry scones. I wanted one! Karen, thank you! Isn't Netflix wonderful?! Thank you, Joy! Yes, a cup of hot tea and a good scone is an unbeatable combination. 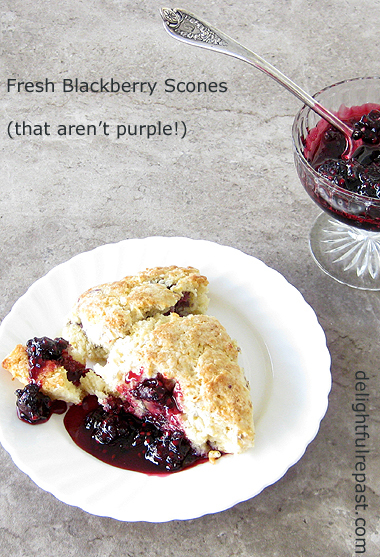 Purple is my favourite colour so I would have loved to see and try out purple blackberry scones. Ha! The rabbit teapot was a post-Easter clearance score from HomeSense (aka HomeGood in the States) a few years ago. I've rarely met a scone I didn't like :-) And these look especially lovely. I like your tip for freezing them for a bit. I'll be saving this recipe for blackberry season! Not too sweet breakfast treat is right up my alley. I'm wondering how much of the flour I could substitute white for whole wheat flour. It makes my wife happy when I do and that makes breakfast even sweeter. Jean - I love the tip you give for freezing the berries to keep them from bleeding into the dough/batter! Thanks for that! Thank you , Amalia! I wish I could say that - but I've been served some pretty bad scones in lots of places! Thanks, Richard. I used to use a lot of whole wheat and found that sometimes as much as half the flour could be whole wheat without drastically changing the thing. Sometimes I'd just make it a third. I made lots of things with all whole wheat, but can't tell you they weren't "different!" My go-to flour is Bob's Red Mill Organic Unbleached All-Purpose, but they also have an Organic 100% Whole Grain Ivory Wheat Flour. David, I'm glad that was helpful. I love sharing some of my learned-the-hard-way tips! We grow our own whole wheat and grind it so this is perfect. Thanks for linking up with #BloggingGrandmothersLinkParty. Candace, thank you. And I love it that you're growing your own wheat! Thanks Jean, half whole wheat flour sounds good. I don't know if I can wait till July to get the fresh local blackberries. Might have to make these with strawberries since they are soon to be in season. Richard, I had no photos to use with my recipe, so I must admit I broke one of my own rules this week and bought a basket of imported blackberries so that I could get the post up well before the season. I'll be making these a lot once July rolls around! Grammy Dee, thank you -- you are the hostess with mostest! Jean, the next best thing to eating these scones is reading about them. I get a boost from a vicarious visit to your kitchen, even if, to be truthful, I need to master your classic scones first before branching out to brambles! I think you know I've had a bit of a blue week and I really appreciate the comforting recipes I find here. Thanks. Your scones look lovely, Jean. I guess my favourite would have to be fruit scones with a sprinkle of cloves in them and a drizzle of icing over them. I always make them at Christmastime. I wonder do you pronounce them scones with the long o or like the Brits which rhymes with lawns?? Happy Easter weekend! Pauline, you are so kind. I *am* all about comfort food and much of it British comfort food. I hope you'll have a better week next week. Sandi, thank you. Funny about the pronunciation. Even in England you have both pronunciations -- and I'm not sure it's strictly regional either. My mother was in the long o camp, and I'm thinking my grandmother was as well. But whether that's common in the Lake District, I couldn't say. I'm definatley an O type of person, Jean. Blackberries grow wild over here. You can see them in hedge rows ( an O sound there too) in the countryside and sometimes in local parks . They used to grow wild in our back garden. Railway embankments are a good place to find them although it is illegal to trespass on railway embankments. You could get yourself killed by a speeding train picking blackberries next to a railway line. As young kids we would take our mum's kitchen bowls and go to the local park and collect them. She would make them into jam. We didn't have them baked in scones though. 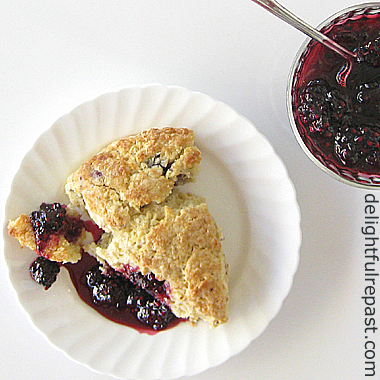 Blackberry scones sound like an excellent idea. Happy Easter to you and Mr Delightful, Jean. Tony, thank you for weighing in on both topics. Scones as in cones; not scones as in cons. How I wish I could find a place - other than a railway embankment, of course - to pick wild blackberries! I love scones but try not to have them too often. I have made all kinds but never ones with blackberries. Sara, thanks. I envy you all your berries. I really must get growing some! Your Blackberry Scones look wonderful, Jean. Love the tip about freezing the berries! As for me, I like any kind of scones - traditional, raisin or fruit! Thank you so much for sharing this delicious recipe with us at Hearth and Soul. Sharing on the Hearth and Soul Facebook page and tweeting. Thank you so much for being a part of Hearth and Soul. Thanks so much, April! *Much* appreciated! Oh you have the very best recipes. So yummy. Thank you for sharing this post at the #BloggingGrandmothersLinkParty. I shared on social media. Oh, Clearissa, that is so sweet! Thank you. Our Blackberries will be ready soon and I will sure have to try your delicious recipe, I can almost taste it already! Hope you are having a great week and thanks so much for sharing your post with us at Full Plate Thursday. Thank you, Miz Helen! And I bet you'll be having berry pies and cobblers, too! This looks so yummy! Thank you for linking up at #TheBloggingGrandmothersLinkParty. Thanks, Lori. It's a fun group! Something that British readers of your articles Jean might find , just a little amusing. You use the term ,"cobblers." It comes from Cockney rhyming slang. Its a crude statement of denigration but it is usually said with a smile. Nobody really takes offence at the use of the word, cobblers. The rhyming bit comes with the full phrase, "cobblers awl," which is of course a sharp spike shoe makers use to put holes into leather. The rhyme is really with ,"awl." but the phrase has been shortened to,just ,"cobblers."Ha! ha! Knew I'd get there in the end!! Have a great day. ( Any ideas what the word refers to?) Maybe not mention , them, on your blog though Jean. HaHa...love the non-purple scones! What a great tip for preventing the bleed. It makes for a tidier looking scone. Fabulous advice as always! Thanks, Jean. Dawn, thank you. I wish I had someplace to collect blackberries besides the grocery store and farmers markets which are both very expensive! Fresh blackberry scones looks delicious I need to try this when I can get some. Now it is really expensive. Thank you, Swathi! I'll be waiting till they're in season and a bit cheaper myself! I had a friend who used to make scones. Before she came into my life I had never had one. Now if I pop into the bakery, it's always the scones that tempt me most. But I have yet to ever make them myself. Still, tucking this recipe away for "maybe someday." =D Thanks, Jean! Ruth, thank you! Glad to hear you're a scone fan! I think you'll enjoy making them once you get into a rhythm. Where a lot of people go wrong is adding too much liquid. Once you get it down, you can quickly make a batch in your sleep! Who can possibly resist a scone. I would substitute blueberries for the backberries but we will not squabble over that. Yummy recipe that is going to my in-house chef and may the diet take a back shelf. Mary, thank you. And no squabble from me - I like blueberries, too! Thank you for sharing this great recipe and helpful tips, Jean. Congratulations on being featured on the recent Blogging Grandmothers Link Up! Thanks so much, Grammy Dee! I'll have to check that out. Thank you, RR! I hope you'll try them soon and let me know how you liked them. Hello, We are a short drive from the market that grows the biggest, most flavorful blackberries. Thanks so much for sharing. Thanks, Mildred. My day would be perfect if I could get to that blackberry grower near you!